"Summertime in the mountains is in full swing, and Curbed Ski is celebrating by releasing a brand-new edition of our Hotel 38 map, our answer to the question, "Where should I stay in ski country?" Whether you use this list to make your 2016 ski plans or to book a summer getaway, we've curated the top ski town hotels from east to west, from Stowe to Tahoe, and all the way north to Whistler. While largely of the luxurious nature, we've also made sure to include a range, from classic top-notch hotels like the The Little Nell, to boutique spots like Telluride's Lumiere, and to B&B's loaded with personality like Whitefish's Garden Wall Inn and Vermont's Pitcher Inn. In this edition, we've cut Alta's Rustler Lodge in favor of Sun Valley's newly renovated Sun Valley Lodge. And while we love the Goldener Hirsch Inn in Park City, we've chosen to refresh the list with the gorgeous St. Regis Deer Valley Resort. So without further adieu, we present the best hotels in ski country. Keep in mind that the order follows not from best to worst, but simply from east to west." Nonetheless, there was Stowe Mountain Lodge, at #3! 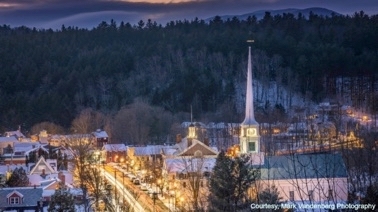 "When it opened in 2008 with 300 guest rooms, the Stowe Mountain Lodge brought the full-service amenities of a resort hotel more commonly found at Western ski areas back to New England, including the hotel’s alpine cabin architecture, stone-framed fireplaces, top-notch service including ski, golf, and fly-fishing “sherpas,” loaner Mercedes, and stellar outdoor pool and hot tub. Its success has been enough to garner the attention of National Geographic and more than a few other publications." Read Megan Barber's complete article here, at Ski Curbed.